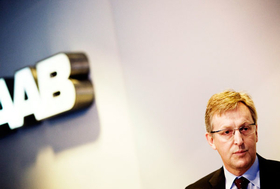 Saab Managing Director Jan-Ake Jonsson will minimize the brand's liquidity impact on GM. Saab is seeking $1 billion (793 million euros) to be self-financing, the company said today after it filed for reorganization under a self-managed Swedish court process. The General Motors-owned Swedish brand said it will work "to create an independent business entity" and will concentrate production, design and engineering in Sweden. Saab said it would continue to operate as normal during the reorganization process, with GM and the Swedish government providing some support. Saab Managing Director Jan-Ake Jonsson said: "We explored and will continue to explore all available options for funding and/or selling Saab. It was determined a formal reorganization would be the best way to create a truly independent entity that is ready for investment." Saab's application for reorganization was approved today by a Swedish district court in Vanersborg, Reuters said. The court has appointed an administrator as a first step in a legal process under which an insolvent company can restructure its business and renegotiate terms with creditors. The process will run for three months and a proposal for Saab's future will be presented to creditors within three weeks, Saab said in a statement. Saab estimates that it made a loss of around 3 billion crowns ($340 million) last year and would run a similar loss this year, the carmaker said in documents submitted to the Swedish court on Friday. "The estimated, still unaudited loss for 2008 amounts to 3 billion crowns. The current outlook for 2009 suggests a similar level of losses and associated funding requirements," Saab said in the document filed with the court. The company said GM had notified the company that it would not fund further projected losses at Saab, but that it would provide liquidity for the company to pursue a reorganization. GM Europe's head of communications Chris Preuss said GM was prepared to provide some funding for Saab but the brand needed outside money as well. He said: “GM has put a substantial amount of money on the table to sustain Saab's operations and to launch the products that are in the pipeline. Preuss said funding for Saab is still intact. “We just need to see how funding can be secured from either government or private sources during the restructuring process,” Preuss told Automotive News Europe. GM's support would also extend to the development costs and tooling for the new 9-5, 9-4X and 9-3X, which will launch in the next 18 months. GM will also continue to provide technical support to Saab in the future and provide parts through licensing agreements, Preuss said, but there were limits to the support GM would provide. Saab has applied for 500 million euros from the European Investment Bank, which is the long-term lending arm of the European Union. The company also is trying to raise more funds from GM as well as from public and private sources. Jonsson said reorganization will allow Saab to launch new models while minimizing the brand's liquidity impact on GM. "With a new 9-5, 9-3X and 9-4X all ready for launch over the next year and a half, Saab has an excellent foundation for strong growth, assuming we can get the funding to complete engineering, tooling and manage launch costs," he said in a statement. Earlier this week, the Swedish government said it is not prepared to take over Saab after GM said it planned to shed the brand quickly as part of its restructuring efforts. GM bought half of Saab in 1990 and took full control in 2000. The brand has made a profit only in one year during GM's ownership. Industry insiders said there has been a greater interest from outside investors in Saab since GM's announcement that it was looking to offload the brand. Saab employs some 4,000 people in Sweden, mainly at its plant in Trollhättan in the southwest of the country. Another 25,000 jobs at suppliers depend on Saab.